Happy last day of September. It is hard to think about being in the last quarter of 2010. Didn't we just start the year yesterday or possibly last week? My S2G project for today features this great Man's Best Friend image. It reminds me of our dog Zoom. He loves to jump up into our lap with his front feet and give kisses. The chair and our lap isn't big enough for him but he thinks I love it. I do & I appreciate his kisses but he gets heavy after a bit. Isn't this the sweetest? What pure love we get from our pets. They are blessing for sure. Please join us in our challenge. Head on over to the challenge blog and show us what ya got. This wonderful blog candy is being offered over at Chrissy's blog. It is ending on Thursday so run...don't walk and get your name added to the list. Chrissy has posted all the details! Happy Thursday to y'all. I am so shocked it is Thursday again and the middle of September to boot. Nic has a football game on Friday and rain is in the forecast. This will be the teams first real challenge. Our last two games have been blowouts. Here is a picture of Nic (#81 the tall one with the red hair) & his girlfriend Kelly...GO VIKS!!! Today for the Thursday challenge over Shirley's 2 Girls we are honoring our critters with a birthday celebration. 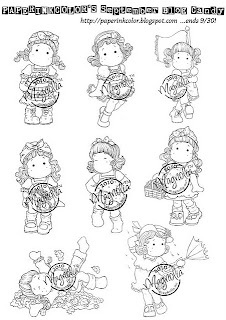 I have used two different digi stamps for my project. Don't you just love this pup jumping from that cake? What a perfect caption. Isn't Spot a great image to add to your pet's gift? I grabbed a new bone from Zoomie's bag and some treats for this picture. I tell ya...that dog didn't even let me get the bag all the way open until he was at my side. He followed me upstairs and was sniffing my desk trying to get his bone and treats. He had to sit in the hallway until I snapped some shots. We would love to see your challenge entry, so bop on over to the challenge blog add you entry and good luck on the challenge. Yummy prizes are in store!!! Today I am sharing this super cute image from Bells n Whistles. It is called Beary Big Hugs and isn't it just adorable. I love images by Elizabeth Bell. Her talent is amazing and just fit my cuteness factor. I was thinking of my son's high school colors and one of the cheers that his girlfriend and the cheerleaders do..."PURPLE POWER". Isn't she and the bear the most squeezable ever?? I used my nesties to frame the image and embossed the background cardstock with a cuttlebug folder. Topped it off using my bow easy bow and added some rhinestones for extra bling. What do you think??? 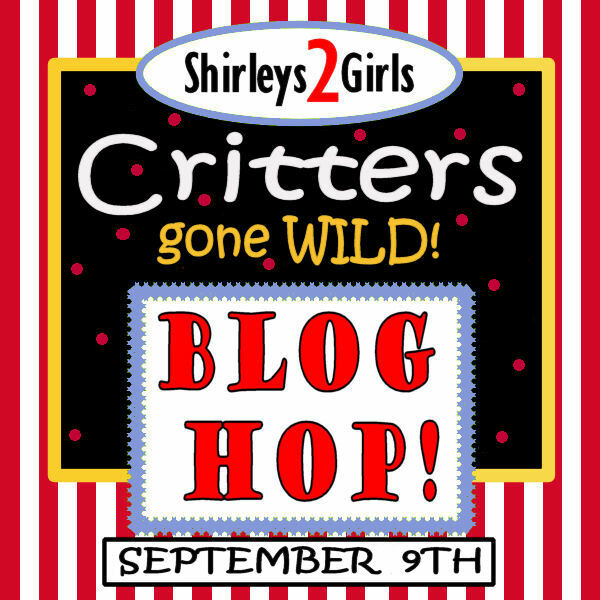 It's Shirley's 2 Girls "Critters Gone Wild" Blog Hop. The design team is saluting the critters in our lives. package! Everything from ribbons to glitters! 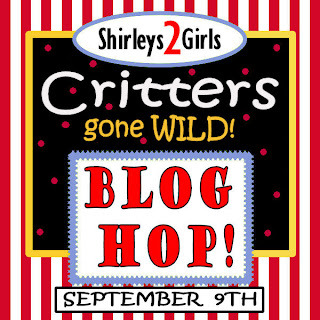 We'll have 1 GRAND PRIZE WINNER of the blog candy and 3 critter digis & a 2nd place winner of 2 critter digis! Here’s how to win….Grab your favorite furry friend and let’s go for a walk around the DT’s blogs! . . On the last stop you will be directed back to the S2G Challenge blog so you can leave us some love. The winners will be selected from the comments left on the Challenge Blog. If you walked here from Laurel's blog, then you’re in the right place. If not, head on back to the S2G Challenge blog to start from the beginning. You don’t want to miss a thing! Challenge to Be a GUEST DT for a CUSTOMER BLOG HOP next month! Exciting...isn't it! Today my project is titled Picture Perfect. I was inspired by a layout I saw in Cardmaker Magazine. My dp is spotted/dotted and I hand stitched the sides. I really like making the 6x6 card but need to purchase some envelopes for them. You can do so much with that size. Our Zoom is a Vizsla and is a ball of energy. He is getting older now and turning gray with less energy but still such a cutie with velvet ears. Ready for your next stop on your walk…Then head on over to Melissa's blog and hope you had fun while visiting here.